I once had to make a concerted effort to hunt down news and images from NASA, but now it seems like I couldn't escape them even if I tried. Take last week, when I saw several of my friends retweet an image of a purple nebula from NASA's Twitter account to honor Prince's passing. Or consider when I was half a world away in Buenos Aires last month, only to find my Argentine host urging me to check out a photo astronaut Tim Kopra had just posted of the city from the International Space Station. The once mighty space agency might be fighting for scraps of funding during an unfriendly administration, but through social media it's simultaneously experiencing something of a golden age. It's not a stretch to say the public's relationship with NASA has never been stronger as a result. Fittingly for a place famed for working wonders with few people, that success is largely thanks to the efforts of just two: NASA Social Media Manager John Yembrick and Deputy Social Media Manager Jason Townsend. Today they're the point men for the agency's 510 social media channels across 14 different platforms. 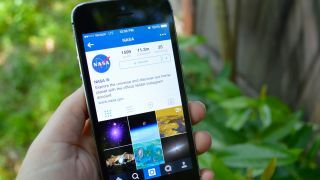 The NASA Twitter account alone reaches almost 16 million people directly, but the duo estimates its total reach across Instagram, Snapchat, Flickr, Tumblr and all other platforms amounts to around 100 million. The Crab Nebula, as promoted on NASA's social media to honor Prince. It's been a steady climb. In a phone conversation with techradar, Townsend tells how the agency first realized the power of social media when the Jet Propulsion Laboratory used Twitter to announce the discovery of water ice on Mars by the Phoenix Lander six years ago. The announcement's mere 163 retweets look pitiful by today's standards, but in 2008, it was transformational. It was NASA's first big step towards breaking away from its filtered information drip lines to traditional news media and embracing the "instant feedback" of social media. Even better, Yembrick says, enthusiasts can follow the accounts of specific projects such as the Commercial Crew program or the Hubble Space Telescope. Projects, in other words, that you wouldn't usually hear about on the evening news. "Typically in the past, you learned about what NASA was doing based on whether or not something went terribly wrong, whether the space shuttle was retiring, or some other big milestone," Yembrick says. "Now, it's no longer just us pushing press releases out the door; it's about us communicating directly to citizens and taxpayers and everything." But as good as Yembrick and Townsend are at their jobs, they're aware that they're Earth-bound groundlings who can only do so much. "Jason and I can talk about being in space and pretty pictures that come out of the space station, but really the only ones that get that perspective of our planet and what it means to be in orbit like that are the people living up there," Yembrick says. Considering the meteor shower of tweets and related posts from those very people since 2010 or so, I was a bit surprised to learn there's no requirement for people in orbit to use social media. Yembrick and Townsend give interested astronauts a bit of training if necessary, but on the whole, the decision to interact with the world in real time remains with the astronaut. No other single space traveler has used social media so well as Scott Kelly, who shot to internet stardom thanks to his near-daily posts on Twitter and Instagram during his recent 340-day stay on the International Space Station. Some of his posts were predictable stuff, such as god's eye shots of massive snowstorms pummeling the US East Coast. On other occasions, though, he'd entertain the billions below by making things like a goofy Halloween video featuring him gliding through hallways wearing a hockey mask. He even held the first Reddit Ask Me Anything (AMA) and the first NASA Facebook Q&A from space. Kelly was so prolific and so fascinating, in fact, that his Twitter account now boasts over a million followers, which is more than some bankable movie stars and singers can claim. The duo notes that Kelly's famed hashtag #YearInSpace was actually his own idea, though Townsend says they "came up with a way to present it and advertise it and talk about it." Yet NASA's social media channels aren't just for showing pretty pictures or serving up bite-sized research; they've also turned out to be an excellent way to get the word out when the agency needs a few more hands on deck. Back in December, for instance, NASA announced it was looking for fresh recruits for its 22nd class of astronauts, and it bolstered that news on its social media accounts with videos of NASA administrator Charles Bolden encouraging people to apply. The recruiters even held their own AMA on Reddit. The public shared, liked and retweeted. And, Yembrick says, the response was "huge." "I think we had people engaging with us that never would have known before that NASA was looking for new astronauts," he says. "Some were thinking about applying or realizing they were qualified to apply. We had all the requirements online for people to see. Literally the whole digital world has made it a lot easier for people to get NASA information than ever before." NASA uses social media to get students involved in science early on. Not everyone can be an astronaut, of course, and thus NASA uses its social media channels to enlist the help of millions of desktop researchers. "We've also got a lot of citizen science initiatives where you can download an app on your phone and help us analyze things like imagery from other planets," Yembrick says. "You can help us count craters and stuff." The upshot of all this is that, for the first time, popular culture is aware of what NASA's doing day after day. "People are connecting with NASA because, I think, they're seeing what we're doing more readily," Yembrick explains. "You can just look at the fact that NASA's integrated into movies and into stories and television shows and talked about in news outlets and ways I could never really imagine before." And they'll continue shooting for the stars. In fact, Townsend seems to think the agency's still light years away from its full social media potential. "The bottom line," he says, "is that wherever people are getting their news from, where people are getting information, NASA wants to be there."